I think it comes as no shock that Vault is a much-loved publisher with everyone at Panel Patter. For me, they are THE publisher to watch, and one that continues to grow with each release. In a world where we obsess over our desire to have the latest in technology, stare into screens and crave a following online. Alex Paknadel’s Friendo takes this idea and pushes it a little further into the future. Taking elements of VR and AI and using that to create your own personal assistant. An assistant that can be a personal shopper, guide, walking search engine, you name it they are there for YOU. But should you be listening and taking advice from a marketing AI that you have created based on a selection of personal questions? 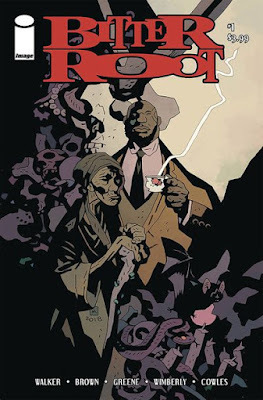 Ever since their stunning run on Power Man and Iron Fist I’ve eagerly awaited something new from the team of David F. Walker and Sandford Greene. So with Bitter Root appearing this week I cannot wait to see what Walker’s highly entertaining writing and Greene’s beautifully expressive art brings. Add to that Greene’s collaborator on his webcomic “1000” Chuck Hogan and we have one hell of a creative team. Set during Harlem Renaissance in the 1920s, Bitter Root promises horror, monster hunters, supernatural forces, mystery and action. The previews alone have piqued my interest and that Akira inspired variant cover… OH MY. Ever since their appearance in Jonathan Hickman’s Infinity story line, I became enamoured with the Black Order. 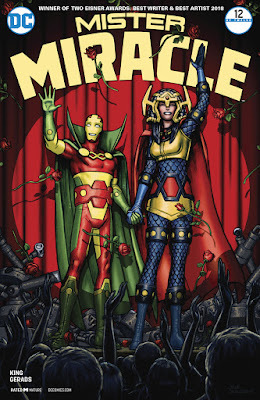 But with my love of Marvel Cosmic taking a back seat of late, only dipping back into the phenomenal Annihilation and Annihilation Conquest stories from the mid-2000s, something new is desired. 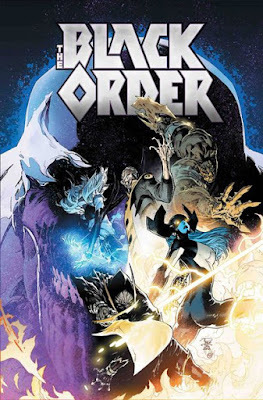 Having missed Infinity Wars and anxiously waiting for Donny Cates Guardians of the Galaxy run in 2019, I hope Derek Landy’s Black Order book is a strong return to my love of Marvel Cosmic. Just that little something that’ll tide me over until the new Guardians book is released. Because who doesn’t love a good story about a band of ruthlessly powerful villains who are set to destabilize a burgeoning empire. Writer Ed Brubaker and artist Sean Phillips are one of the very best creative teams in comics, and this is probably my favorite work of theirs. They tell a lot of mystery stories, stores relating to crime, tortured souls, and poor doomed saps. 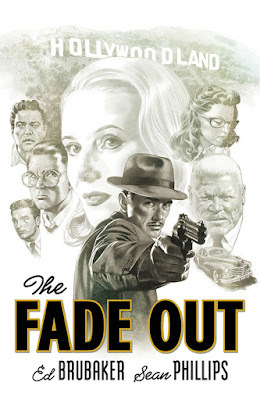 Well, it all comes together in The Fade Out, which is a fantastic post-WWII crime noir story set in the seedy underbelly of the glitz and glamour of Hollywood. If you liked LA Confidential then you'd like this. If you didn't like LA Confidential, what the hell is wrong with you? This story is a fantastic murder mystery, and you will absolutely fall in love with the moody, atmospheric, stylishly beautiful artwork of Sean Philips, colored by the talented Elizabeth Breitweiser. I absolutely adore this book, and now that it's been collected in a more affordable paper edition, it's the perfect time to pick it up. 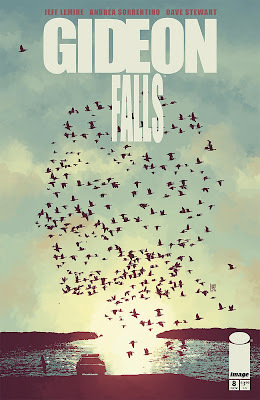 Gideon Falls is without question one of my top comics of 2018. It a super creepy, unsettling, religious horror book. The horror doesn't come from gore - no, the horror is much more insidious and unsettling than that. It's about visions of evil and darkness just out of reach, and about the troubled people that are experiencing this horror. Jeff Lemire knows how to tell a scary story, and the artwork from Andrea Sorrentino (with colors from the master Dave Stewart) is spectacular and scary and unsettling and really inventive. Keeping with the theme of scary comics, this is another successfully creepy book. It is in the excellent "horror in space" genre, which makes for great storytelling. This is a space station containing the very last life in the entire universe. Seriously, everything else in the universe is gone, they're experiencing the heat death of the universe and the people aboard this station are all that's left. Not just of humanity, but of anything. No more planets, no more stars. Just the...Infinite dark! So far the book is appropriately creepy and unnerving. There's murder aboard the station, and things are weird and getting weirder. Andrea Mutti is an excellent artist, and brings this story to unsettling, weird life. This is strong book. The big conclusion. I'm so interested to see how this book gets resolved. It's really been a remarkable story, one that I don't think I'll fully appreciate until it's done. It's been a very cool, weird story about the New Gods, and about family, but this is really a story about someone dealing with profound depression and also probably some psychoses. It doesn't sound fun, but it actually is. Mitch Gerads has done the best work I've ever seen from him. This book is just stunning and weird and so compelling. 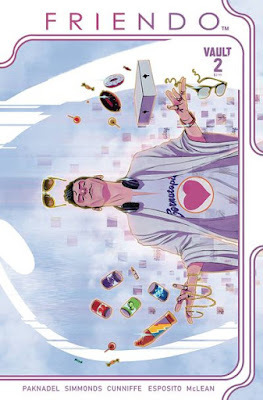 After the shocking events of the first issue, Leo's recovery involves a lot of retail therapy, aided and abetted by his virtual pal Jerry, who lives inside his special glasses. Jerry plays his role of friend and shopping advocate well--but something's not quite right as this second issue takes us deeper into a world where the idea of an Alexa/Siri style assistant becomes more than just a box on your nightstand. Alex creates a world where corporations have entire too much control over our lives, and shows it in subtle ways (like the one-off panel about a man who has to humiliate himself with a horse to get health insurance--for only a year!). It's a logical, terrifying extension of where we're headed--not unlike Chris Sebela and company's Crowded. Meanwhile Simmonds and Cunniffe's art really make this work, giving the world a shiny, slick feel and making some amazing visual choices. I especially enjoy how the color scheme makes it clear which "world" we're in. Disclosure: Alex is a "friendo" of mine, but even if he wasn't, I'd recommend this sci-fi story to everyone. Brother Nash is a trucker...who also happens to have the ability to turn into a beast when the conditions are right. 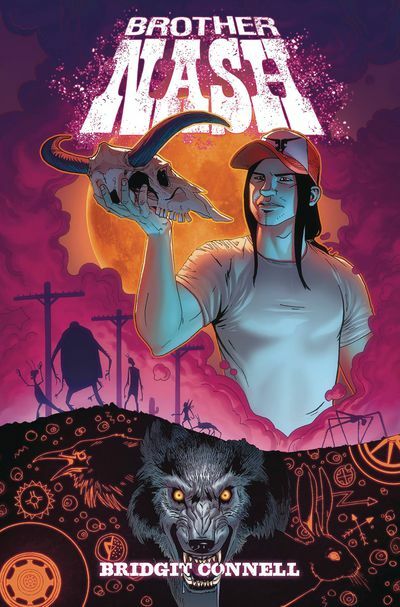 He faces all sorts of supernatural enemies both on and off the interstate in this entertaining, colorful, and well-illustrated webcomic, collected here by Titan. The characters are engaging, and Connell uses the tropes of horror and truckers-from-movies extremely well. I love her monster designs and she gives Nash just enough human elements without dragging the story down in unnecessary drama. This one was hand-sold to me by one of my local shop owners, and I'm glad she did. Now I'm passing along the recommendation to you! We all know a lot of buildings are missing an official 13th floor because of superstition, but what if it's because the building itself reserves that floor for sinister purposes? 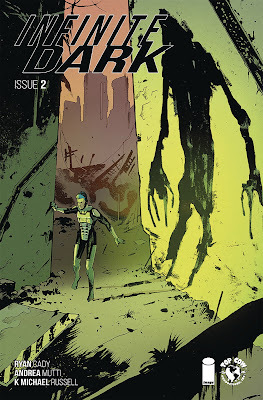 That's the premise here, as the 2000AD writing duo of Grant and Wagner combine with artist Jose Ortiz to write an ongoing feature for Scream, a British horror mag akin to Creepy. A state of the art building run by "Max," an intelligent computer insistent on protecting its residents no matter what it takes, is the focus of this set of stories. 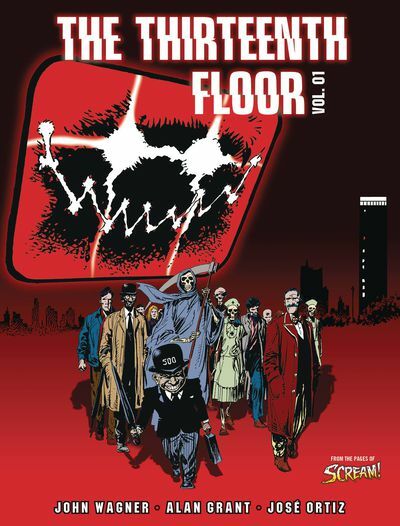 When it feels like the residents need protection, Max drops off the threat to the 13th floor, which changes features to fit the criminal's intentions. In other words, "What if the Spectre was a technological haunted house?" --and if that doesn't intrigue you, I'm so sorry for your reading habits. This is another in a series of excellent reprints from 2000AD of other British comics, reproduced in high quality and shining a light on some great comics that might otherwise be forgotten. If you're an EC/Warren fan, make sure you pick this one up. It's great stuff. There are monsters in Harlem, and only a special family can stop them, but as the family seems to grow weaker, the monsters do not. Battling the supernatural and racism, they may be humanity's only hope, but the challenge they face is far greater than ever. 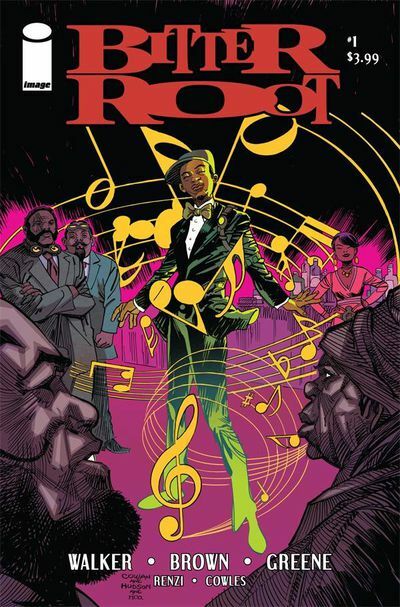 David F. Walker and Sanford Greene talked about this book at Rose City in 2017, and I've been waiting for it ever since. Unsurprisingly, it's every bit as good as I hoped. Sanford's linework is loose and gives everyone, both monsters and humans, an exaggerated feel that works well for a horror comic. (What's cool is that unlike some, he can do this without making a mess of the flow of the action.) Meanwhile, David as always has a great way with characters and interaction, and his single-issue story flow is getting better and better. This one has a great cliffhanger, and it also shows that Walker, Greene, and co aren't afraid to get into controversial territory--no surprise, if you know David at all. So many great horror books in 2018--don't leave this one off you list.